Not having a number plate or having one that is defective or fancy is an offence as per the rules of Traffic rules, but the capital traffic warden is not smart to ensure that the rule is followed throughout the capital city. The local people at C Sector here allege that VIP accompanied by pilot and escorts in many cases violated traffic rule and even don’t care properly to other commuters on the roads and in some cases they use rash driving resulting to fear to others on the pathetic road of capital complex. Giving an example of Thursday evening around 5.30 pm a VIP vehicle (Scorpio) without number plate being escorted by a pilot vehicle coming from Itanagar toward Naharlaugn have violated the traffic rule by overtaking and not following the same route of the NH-415 rather it went through coming direction by blowing siren all along the way. The locals said in some case it have been observed that these VIP vehicle even blow siren when there are no VIP in their vehicle and harass the general commuters. 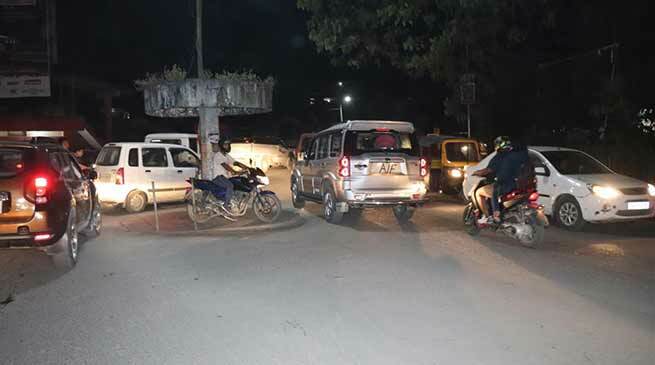 They said that everyday there use to have a traffic person from ITW at try junction near KV-I in C Sector but today evening he was not available and the incident happened but who care, its happened and went on saying that ‘Arunachal is land of khushi khushi’. One lady driving Scooty toward Itanagar said I was about to hit by the said VIP cascade but god save me, she said that I was about to hit the said vehicle if I did not stopped there at once by using required brake.